If you’re looking for ways to encourage your little one to start talking, there are a lot of clever tips you can try. However, first you need to understand that most children cannot use two or three word sentences until they are at least two years of age. This is only a guideline however, and some may well start a little earlier, or even a lot later. Each child develops at their own pace so if they are a little slower, it’s not typically something you need to worry about. Babies actually communicate and talk to you, in their own way, right from birth. So, there are things you can do from the minute you bring your little one home, to encourage them to start talking. Here, you’ll discover some of the best tips to encourage healthy speech development in babies. Studies have shown that babies start to learn about language and communication when they’re still in the womb. They may not be able to say anything for a while, but once they are born their little brains begin to absorb information extremely quickly. So, even if they can’t respond, they can still learn a lot about language and speech through you. Reading baby books, particularly ones that boast a lot of color and different textures, can really help develop your baby’s speech and language skills. Some parents have even reported their baby said their first word at just six months old, after being read to regularly. You don’t have to read books to your baby to help them develop their language skills. Simply talking about anything throughout the day will help. So, whilst it may seem a little crazy and awkward at first, get into the habit of having one-sided conversations with your baby – and have these conversations often. You could talk about anything – the weather, what you’ve got planned for the day, or a simple running commentary on the tasks at hand. Your baby doesn’t need to understand every word, they just need to hear you talking. This is also a fantastic way to bond with baby and you’ll start to notice their different reactions to the things you say. Babies LOVE to hear you singing. Remember, speech and language development isn’t just about talking – it’s about rhythm. Singing helps baby to learn more about rhythm and most importantly of all – it’s fun! Another advantage of singing, especially when it comes to nursery rhymes, is the repetitiveness. The more your baby hears certain words, the more likely they are to grasp onto them. Of course, this can have pretty hilarious results when it comes to their first words! If you want those precious first words to resemble more “Momma” or “Dadda”, you’ll want to focus more on those nearer the time your little one is likely to say their first word, than repetitive nursery rhyme words! Again, this one can feel a little awkward. Why would you ask baby a lot of questions when they clearly can’t answer you? Well, it can really help to teach baby more about having actual conversations, rather than just saying random words. It’s important to note here, that you should also answer the questions you ask. So, for example, you could ask “Shall we go to the park today?”, then answer with “Yes, I think we will”. Keep the questions and answers short so it’s easy for baby to follow. There’s a lot of different questions you can ask throughout the day. You may even be surprised just how used to talking to yourself you become. It’s easy to get carried away when trying to expose your baby to as many words as possible. While constant chats and questions are fantastic at helping to encourage baby to start talking, it’s equally as important to listen. Your baby needs to be given the opportunity to repeat and respond to what they are hearing. Even if all they can manage at the moment is a cooing noise, this is their way of copying and learning how to say things. So, when you notice baby responding, in whatever way that may be, stop talking, listen and simply pay attention to your little one. They will love to see you paying attention to what they are saying. When you’re looking after a newborn, it’s easy to get distracted when you’ve got a million and one things to do. As you’re busy rushing around trying to clean, prepare for the next feed and change your baby, you can miss out on some excellent opportunities for language development. Throughout the day, try to watch your baby and see what grabs their attention. Perhaps they are spending a lot of time gazing up at a light fixture, or they seem transfixed by an apple. Take it as an opportunity to talk to them about what they are looking at. Point to the item and say its name. Your baby will soon start to understand exactly what it is they’re looking at. It’s not just your own voice that will spark baby’s interest. There’s plenty of surrounding noises that can help teach language development. It could be a washing machine spinning around, or a neighbor’s dog barking. Whatever the noise is, say to baby “I can hear” then follow up with whatever the noise is. Then make a point of showing them you’re listening to the noise. This is an especially good tip to follow if your little one is a little older as toddlers will find it much easier to understand surrounding noises. When your baby does manage to start saying the odd word, make a big deal out of it. Praise them, clap and make it rewarding. Children love it when they do something right, so if you make talking a positive thing, they’ll be more likely to grasp on to new words in order to impress you. They’ll also feel proud of themselves which will again make them eager to learn and say new things. Pacifiers are great for soothing babies, but they can potentially get in the way of speech development. This is because, it’s not easy to speak with something in your mouth. So, if you’re trying to follow the tips above, especially when it comes to listening out for baby’s reactions, it’s going to be really difficult with a pacifier in the way. This is a skill all parents need to learn, yet it can be really difficult. When it comes to teaching language and speech to babies and toddlers, patience is the key. If you try to rush them, you risk making speech development a stressful experience that your child will dread. When reading books together and waiting for a response, give them time. Don’t try to talk for them before giving them ample opportunity to respond. If you’re patient and there’s no pressure on baby to speak, you’ll find those new words come much quicker and easier than they would if baby felt pressured. 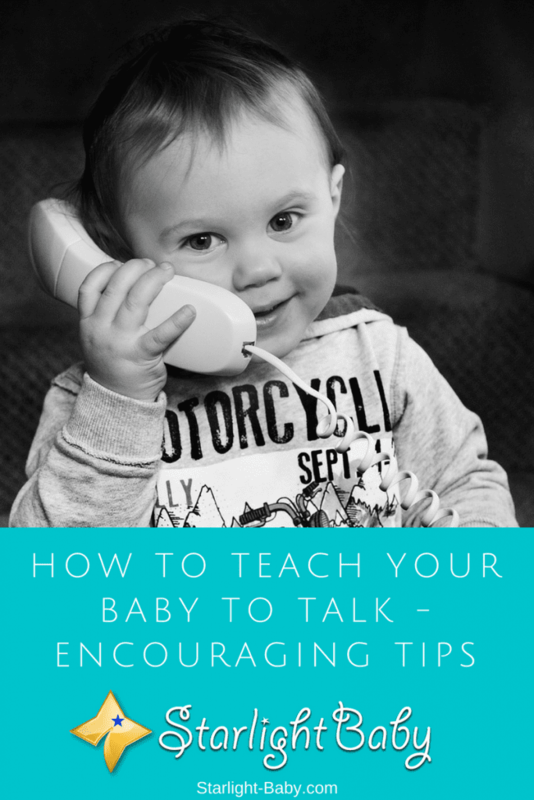 Overall, these are the main tips you can follow to encourage baby to start talking. It helps to be aware of the general language development milestones, but never hold these as a strict rule as to when your little one should be talking. If baby isn’t saying around 15 words by the time they reach 18 months, then is the time to seek advice from your pediatrician. There’s likely nothing to be concerned about, but it’s always worth getting advice just to be on the safe side. In any case, following these 10 tips should definitely help when teaching your baby to talk. Have any advice of your own? Do us all a favor and share it with us below – we could all benefit from hearing what’s worked well for you! Great tips! i will use it with my 2 little girls. it really requires patients but i think that all this tips can really help. My best tip would probably be: just keep talking! Nonstop. Even if you feel silly, the baby is constantly listening to you and your voice. I’ve been reading to my toddler ever since he was born (like you’ve suggested). I can tell you that it’s great for encouraging them to start talking because they are usually very interested in what’s going on even if they can’t fully grasp it – they want to ”join in”. Patience is definitely the key though, along with determination. Don’t be discouraged if they don’t start talking at the exact time you expect them to. You have to know that each baby develops at his/her own pace. Some start talking way before others. I still fully recall how ours was first just mumbling and making noises then those noises slowly, over time, turned into words. Overall, great tips that all work. I didn’t start talking until I was a little over two years old. My parents were worried, but they never pushed me. Some people told them to take me to speech therapy, but they decided to let me go at my own pace. I think it’s important to encourage your toddler and let them learn at their own pace. Some toddlers don’t start talking until later and that’s perfectly okay. Don’t push them or they might feel uncomfortable with speaking. For books, I really recommend the books that come with sounds. Those books are a hit with my child. We take time to read from them everyday and she loves to press the buttons. She can only blabber a little, but I know she’s trying to repeat words after the book. In the good old days when there were enough siblings around there was no need to get the child into talking. They helped with what today is kind of a task. My sister’s baby boy became dependent on his pacifier and that delayed his speech development a bit, so I’m really happy you included this as a warning! Mothers should try their very best to slowly discourage their babies from using the pacifier, because if they don’t do so early on then it becomes extremely hard to stop it, and by the time you realize something’s not right, you already have a big problem in your hands. A year from now, my baby will be 16 months old. That’s when he will begin to speak. As a new parent, I don’t have any ideas on how to encourage the baby to speak. This article presents really great tips. When my baby begins to understand sounds, I will encourage him to speak by speaking to him, reading aloud, ask questions, sing rhymes etc. I agree with your view on a pacifier. I will make sure my baby does not get a pacifier when he is ready to speak. Baby talking actually differ in most children, some tend to start talking more earlier than others, it’d just how the baby’s nature was meant to be for him/her. Sometimes, I could be hereditary traits that makes some speaks more faster than others. For instance, there was one family in the compound I live in, the husband is a chronic talkertive. They had a new and it didn’t take that child up to 8 months and she started talking very audibly even when she was yet to start walking. These are very wonderful tips any parent can employ in encouraging their baby to talk. I love the last point on being patient with the child because they are still new to the task, so allow them get used to it and not try over forcing it. Our baby is one year old now. He calls his mother, his father, his grandparents. He understands, Prince is our dog, however, he can’t call prince. When he is hungry or thirsty he can ask for food and water, he can say no. We talk with the baby to encourage him verbalise communication, we sing and read in order to introduce words. I have seen babies of my baby’s age talk more or talk less. I have a niece, who is twice the age of my baby, yet she does not talk much.